Industrial machinery is the backbone of most manufacturing facilities and production plants. These machines do everything from producing parts to assembling finished products and keeping them in prime condition is extremely important. The quality of a product is directly reflected in the quality of the machinery that helped create it, so in the interest of producing high-quality goods and keeping consumers happy, it would be wise to invest in top-of-the-line industrial lubrication and spray mist systems. A fair number of industrial lubricants – most notably, those sold by MagLube – also function as cleaners. This ensures that every time lubricant is applied to machine components through one of our spray mist systems, those parts are purged of various dirt and debris. Lubricants that are able to remove dry chips from tool paths can also save workers a tremendous amount of time and hassle. The user-friendly spray mist systems from MagLube can play an important role in keeping your machines up and running for the foreseeable future. These systems ensure that your machine’s core components remain consistently lubricated, effectively reducing heat and friction. Since your machine’s components are constantly grinding against one another, proper lubrication is needed to prevent excessive friction – which can lead to a host of costly issues. 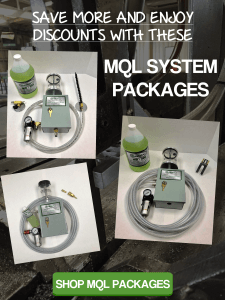 Industrial lubrication and spray mist systems stands to save your business a considerable sum of money over the long-term. Regular lubrication reduces the need for expensive repairs and part-replacements, saving many manufacturing companies thousands of dollars each year. When working with industrial machinery, you can’t afford to skimp on maintenance. Failure to properly care for your highly-specialized tools stands to dramatically reduce their respective life-spans and have adverse effects on your output. Fortunately, investing in a reliable lubrication and spray mist systems is an effective way to keep your machines going strong for many years to come. If you’re in the market for high-quality industrial lubricants, look no further than MagLube.com. We offer a variety of different products suitable for any machining need. Contact us today at 800-441-2023 for more information about our lubricants.